For many working class guys, there’s nothing better than a quality pair of work boots. They make getting through a tough day on the job safer and more comfortable. Primarily made for dangerous work environments, these boots are designed to improve job performance by keeping feet and toes out of harm’s way. Numerous industries require the use of high-quality work boots. This is due to the ample safety precautions taken with design and construction. Work boots need to withstand constant wear and tear while protecting feet from unforeseen accidents. Thanks to modern designs and superior materials, guys can rest assured that their feet are protected from whatever their job throws at them. In addition to providing protection, great boots need to be comfortable. A big part of safety is comfort. By eliminating the constant ache that may come from standing around all day in substandard boots, workers can stay focused on the job in front of them. Unfortunately, finding the right pair of work boots is easier said than done. Here are some of the best options currently available today. 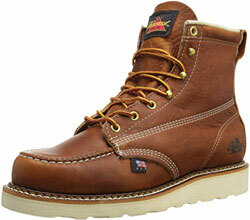 From the renowned machinery company is this great work boot. It’s clad entirely in waterproof leather and features a padded collar for comfort. Inside, a steel toe keeps the feet safe from accidents. A removable gel insert is also used to keep the foot comfortable and stable. The boot is lined with 200 grams of Thinsulate insulation for optimal protection from the elements. When it’s not cold outside, a nylon mesh material wicks away sweat to keep the toes dry and free from smells. A thick rubber sole with a strategic design keeps your feet on the ground at all times. 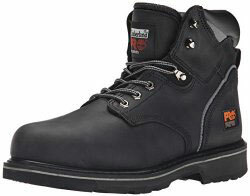 This pair of boots from Timberland is designed to be safe and comfortable in all work environments. The upper is made from waterproof leather to stay dry. The seams are sealed for added security. In terms of comfort, careful consideration was taken in design and materials. The 24/7 Comfort Suspension system is used to support the arches and provide shock diffusion with every step. 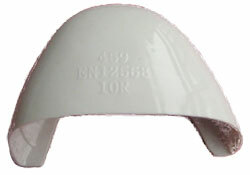 The sole is also made to provide electrical hazard protection. A steel toe cover adds another layer of protection while the mesh lining treated with anti-microbial treatment ensures that feet don’t offend when its time to go home. 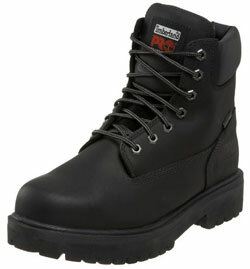 Another option from Timberland is the Pro Pitboss boot. It has a 6-inch shaft and is made from leather. The sole is made from synthetic material that’s resistant to slips, oil, and abrasion. The unique thing about this boot is that it has a wider toe box for more flexibility and comfort. It’s covered in steel and meets the ANSI safety standards as well. The footbed is made from soft foam that’s covered in an antimicrobial cover while the midsole has polyurethane for moisture wicking and shock absorption. This soft toe option from Timberland doesn’t provide toe protection but is does offer a number of great features. It’s made from full-grain leather that’s treated to repel water. The boots are heavily insulated inside, making it perfect for trudging through the snow. 400 grams of Thinsulate will keep the feet toasty at all times. A removable sock liner made from polyurethane is also included to help keep the feet dry and avoid abrasive injuries like blisters. There’s also a great shock-diffusion plate made of nylon to reduce fatigue. If style is what you’re after, this option from Thorogood is perfect. The upper is made from oil-tanned leather. Prominent stitching and rugged lace eyelets complete the stylish look. The sole is made from a durable synthetic material that’s oil and slip-resistant. Inside, it has a dual-density insole that’s made to absorb as much shock as possible. The boots are made using the Goodyear Welt construction method, so workers can rest assured that they’ll last for many years of work. Available in a number of eye-catching styles, this work boot is ready to keep workers comfortable during work hours and stylish when it’s time to clock out. The upper is made from leather while the sole is made from synthetic material. The leather is treated to be waterproof. Carefully designed treads prevent slipping in wet conditions. It uses Goodyear Welt construction and triple stitching for long-lasting protection. The thick heel measures 1 inch in height, making it perfect for guys that want a bit of extra cushion and support. 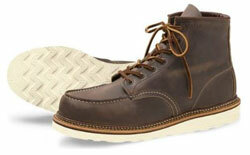 This moc-toe boot from Irish Setter is both stylish and durable. While there is no protection on the toe, the thick leather uppers provide great water and dirt protection. The shaft measures roughly 6 inches for added ankle protection. 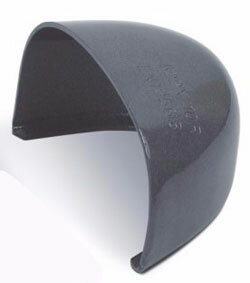 The rubber sole meets ASTM standards against electrical hazards. It also has high traction and great heat resistance. A cushioned footbed and EVA midsole make it comfortable for hours of wear. The extra cushion protects from foot fatigue on any type of terrain. From Golden Fox is this affordable soft toe boot. While it is a great-looking option, it also has a number of protective features that make it ideal for the worksite. An oiled leather upper keeps it tough and comfortable after the break-in period. Pigskin on the collar and a mesh lining inside adds more layers of protection in the winter. The thick wedge sole adds plenty of stability while managing to stay light. There’s also a removable insole for added comfort. With Golden Fox using the Goodyear Welt construction method, the boots will last for quite some time. Before going out and buying the first pair you see, there’s a lot to consider. Essentially, work boots are just another tool that’s used on the job. Because of this, it’s important to consider the job itself and the working environment. This helps narrow down the choices and makes finding the perfect pair of boots a cinch. Actions performed, potential hazards, and the environment as a whole should be considered. One of the first things to look for is the presence of a safety toe. 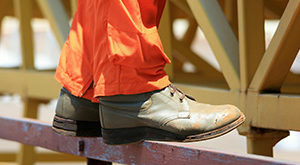 Many jobs require work boots with safety toes to protect the feet from potentially dangerous injuries. They’re perfect for guys that work around heavy equipment that could possibly fall and break the toes. Essentially, safety toes are tough pieces of material built directly into the boot. There are three different types of safety toes. Steel safety toes are the most widespread and effective. Thick steel offers the most protection. However, steel can be a bit hefty. It’s known to weigh down feet and cause fatigue quicker than lighter alternatives. Furthermore, the metal is affected by outside temperatures. In colder environments, the steel toe can cause more discomfort than protection. Plus, there’s the added annoyance of setting off a metal detector. Aluminum is a great alternative to steel. It’s much lighter than the previous option and just as strong. 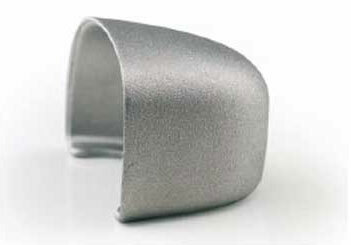 However, the downside to aluminum is that it requires more bulk to provide the same protection as steel. Aluminum safety toes take up much more room and can become cumbersome with a hard day at work. They’re also affected by temperature. In most cases, choosing between steel and aluminum is just a matter of personal preference. Composite toes are relatively new compared to metal safety toes. However, the material has a number of great advantages. One of the biggest is that its made from plastic, carbon fiber, or Kevlar depending on the manufacturer. Because the material is not made from metal, there’s no concern about energy transfer. They stay the same temperature regardless of the climate outside, making them a great option for outdoor work. They also allow workers to walk through a metal detector without issues. With that being said, composite safety toes lack the high amount of protection that metal alternatives do. They are also the bulkiest choice out of the bunch. If the job calls for an extra layer of protection, it may be good to invest in boots with a metatarsal guard. Named after vital bones in the foot, these guards act very similarly to safety toes. However, they extend far beyond the toes to cover the top of the foot. Many heavy-duty boots have a guard built in with the same material as the toe. They resist a high amount of force from falling objects and accidents. On the downside, they add a bit of weight and bulk to the overall shoe. In most cases, additional metatarsal guards are only recommended for guys with certain jobs, such as welders, railroad workers, or loggers. A pair of boots is only as good as the heel and soles. Regardless of industry, it’s often recommended to get slip-resistant soles. Many manufacturers use rubber soles with intricate designs that redirect dirt and grime away from the center of the sole. This creates stability in variable conditions They’ll help avoid fall injuries that result from walking on water, oil, and a variety of other surfaces. Depending on the work environment, there are a number of other additional forms of protection. One of the most common is puncture resistance to protect from nails, glass, and other sharp materials. Essentially, a tough plate made of metal is built into the sole to protect the bottom of the feet. Acid protection is another common concern. With these types of boots, TPU is used on the soles due to it’s resistance to damage from acids. 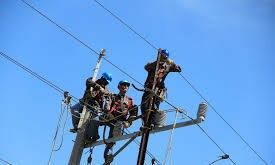 If the job requires extra precaution from electrical shock, many brands have it covered. Electrical hazard work boots use a couple of different methods to keep works protected. One method utilizes non-conductive materials throughout the construction to avoid electrocution. The other uses a conductive insole to prevent the buildup of static electricity. In addition to design and materials, a boot’s construction plays a big role in its overall comfort, durability, and performance. 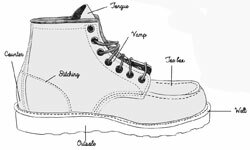 There are a few different ways to create work boots. They all have their advantages and disadvantages. The key is to choose what’s more important for the worker and job at hand. As the name implies, cement construction utilizes a strong adhesive to attach the upper portion of the boot to the sole. It’s the cheapest method to construct a work boot and fairly common among even the most popular brands. This is because the method results in very flexible and lightweight boot. On the other hand, these boots are known for their inferior durability. Once they have become damaged, there’s no way to repair them. There’s no choice but to get a new pair. This is a unique method that permanently attaches two separate parts of the boot in one swift step. Essentially, the entire upper portion of the boot is attached to a mold. This mold is then filled with molten rubber to create the sole. As it hardens, the sole bonds to the rest of the boot to create a tight and strong seal. The end product is light and comfortable. These boots are also known for being efficient in absorbing shocks. Like the previous method, these boots are practically impossible to repair once broken. Also known as the Goodyear Welt method, this process involves a piece of synthetic or leather material. This piece is sandwiched between the upper boot and sole. It’s attached to both pieces for an incredibly rugged build. These boots are known to last for many years because they are so durable. 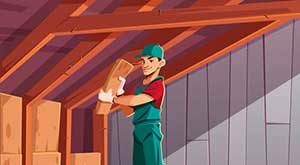 Furthermore, issues can be repaired easily by an experienced professional. 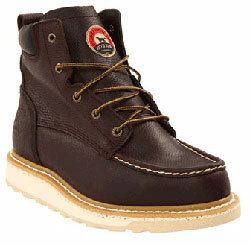 It’s often used by top brands to create rugged boots for the toughest of work environments. 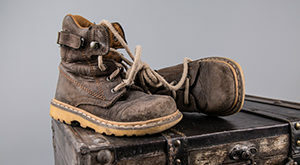 The materials used in a pair of work boots have a direct influence on many factors. While some manufacturers may experiment with various materials, most stick to a tried and true formula. 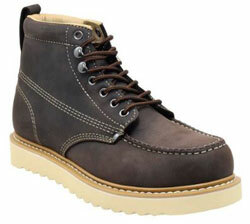 Rubber, leather, and synthetic materials are the most commonly used when creating work boots. These materials are used for their durability and protection. 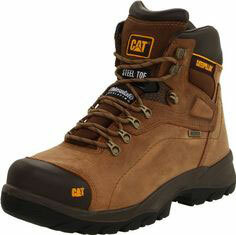 It’s a good idea to look for boots that are comprised of materials fitted for the particular work environment. For example, workers constantly surrounded by water may want to look at treated leather or synthetic material that repels moisture away. When it comes to materials used inside the boots, the possibilities are endless. Many incorporate some form of cushion to keep the feet comfortable throughout the work day. This cushion may be made of foam or rubber. Some are even removable for easy cleanup. In colder environments, it may be worth investing in work boots lined with Thinsulate or polyester. These materials retain heat to keep the feet warm in tough winters. For even more versatility, go with boots that have removable liners for the summer. When it comes to work boots, brand names carry a lot of weight. Some of the most popular brands have been perfecting their design and construction for decades. With safety being a big concern, choosing the best possible brand is important. Understanding which brands to go for will help workers avoid cheap knock-offs that could put them in potentially dangerous situations. 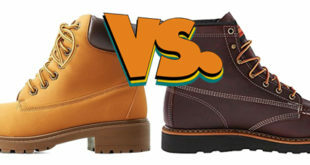 Probably one of the most prominent brands out there, Timberland has made a name for themselves in the industry. They’re known for having reliable boots that can hold up in even the toughest environment. The company has a large line of options. In fact, some of their staple designs have been offered for decades. Their boots are comfortable to wear straight out of the box. However, they aren’t particularly known for outlasting the competition. In other words, they may require a replacement after only a year or so of use. Caterpillar is a big player in the world of construction. Not only do they create great shoes, but they’re also known for their effective equipment line. Caterpillar work boots are made from high-quality materials and build with durability in mind. Upon purchase, it pretty much comes as a given that they’ll last for a few years. The only downside with the brand is that new boots can take a while to get used to. However, once broken in, they’ll be comfortable and ready for a hard day of work. Red Wing has a reputation for their superb line of work boots. The company is one of the oldest in the industry. They’ve been established for over 80 years at this point and continue to go strong. One thing that sets this company apart from others is their great style. Work boots are impressive. Unfortunately, with high style comes a high price tag. 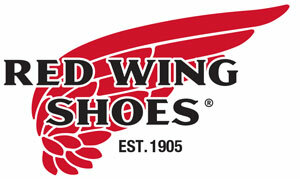 Red Wing is notorious for being pricey. With that being said, buyers are getting top-notch quality. Keen is a lesser-known and more affordable brand. They create great work boots that are comfortable, reliable, and surprisingly stylish. They have a signature design and style of construction that sets them apart. Quality materials ensure that boots will last for quite some time regardless of what they’re put through. The best thing about Keen is that they’re relatively cheap. Workers can get a superior pair of work boots without breaking the bank. Wolverine puts their focus on comfort and durability. 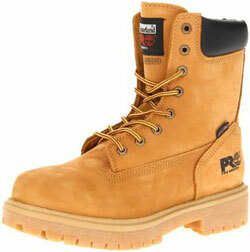 The company’s numerous work boots are some of the most comfortable options available. Furthermore, there’s little to no break in period. Workers can slip them on and start working without having to worry about the pain that’s commonly associated with new boots. They also stand the test of time. The only downside is that the boots are not much to look at. The company isn’t focused on flashy designs but rather a truly effective work boot. Before heading out to the worksite, it’s important to slip on the best pair of work boots money can buy. While they may seem like a steep investment, nothing can put a price tag on safety and comfort. With first-class design and impeccable construction, these work boots are well worth it.